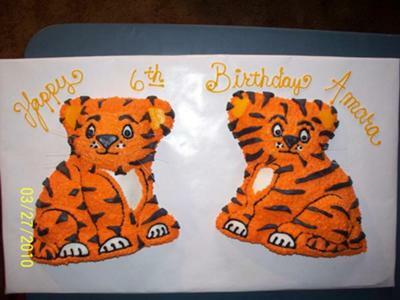 To make these tiger cakes, I used the 3-D stand up Wilton lion cake pan. I put a small piece of aluminum foil over the hole on the back section of the cake pan. I sprayed both front and back pans with the cooking spray with flour. I did NOT snap pans together. I filled each section with 1/2 the cake mix. I used one mix. I baked with pans separate. I baked until done, then let cool completely. I iced in orange buttercream with the star tip. I used yellow buttercream for the center of the ears, black for the outlines and white for the eyes. I made home made marshmallow fondant and colored it black for the stripes and just cut random pieces. And I added small pieces of fishing line for whiskers.